Pipeline Integrity - Ammonite Corrosion Engineering Inc. 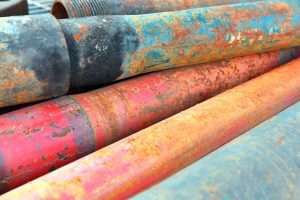 Preventing corrosion is vital in every step in the production of Oil & Gas. Ammonite Corrosion Engineers identify corrosive conditions and set operating limits for monitoring process conditions. Our firm conducts Internal Corrosion Direct Assessment (ICDA) services for major pipeline operators by creating and reviewing pipeline operation and maintenance programs and manuals, and assisting in scheduling maintenance activities on pipeline systems. Evaluation of internal corrosion potential of pipeline fluids. Methods of monitoring internal corrosion. Methods of corrosion inhibition and mitigation of internal corrosion. Evaluation of chemical corrosion inhibitors for effectiveness. Methods/procedures to mitigate/rehabilitate internally corroded pipelines. Materials selection and specification of new pipelines for all fluids. Selection and specification of non-metallic pipelines, alloy pipelines, internally clad pipelines and non-metallic liners for corrosive fluids. Methods of monitoring the condition of external coatings of pipelines. Evaluation of external coatings of pipelines. Selection and specification of external coatings for all pipeline materials including mainline, girth weld and repair/rehabilitation. Design, specification, purchase and installation of cathodic protection for pipelines including sacrificial anode and impressed current systems. On-going evaluation of cathodic protection systems (e.g. annual potential surveys) including estimates of remaining life of anodes/ground bed. Selection of in-line inspection tools (“smart pigs”) for pipeline corrosion/condition evaluations. Interpretation of smart pig inspections and recommendations for further evaluations: excavations, repairs, re-hydrotesting, etc. Prepare Pipeline Integrity Management Program as per Z662 Annex N.
Can assist in preparing/supporting the Risk Assessment Program as per Z662 Annex B.
AER Directive 77, Section 5, CSA Z662 Annex N, Integrity Management Program is mandatory for all Pipelines in Alberta. We can prepare such programs for our Clients.